Let’s start with something as simple and unassuming as the humble potato. When we try and think of all the uses for this simple starch, amongst different cultures and types of cuisine, we immediately discover a dizzying array of possibilities. Consider the numerous types of potato, the ease with which it marries with other ingredients, the various methods of cooking it, and you have quite possibly the perfect base for a dish, a chef’s clay if you will. Potatoes may be yellow, white, red or even purple. They can be large, baby, new or fingerling. In its most simple form, potatoes may be mashed, roasted, fried, scalloped or simply boiled and cubed served cold in a salad… But when we then think of the potato transformed into something more, our thoughts turn to latkes, kugel, gratins, gnocchi, tortilla, patatas bravas, dum aloo, or even the much celebrated pommes puree a la Joel Robuchon. So in looking for an inspiration for a new dish, I though why not try once more to take the humble potato in a little unordinary… or should I say, extraordinary direction…. 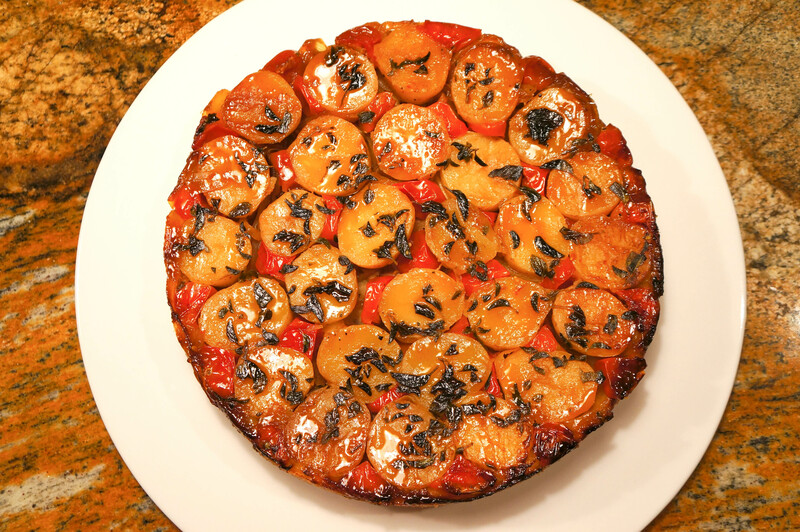 This dish is creative riff on a traditional French-style tart tatin with the distinct Mediterranean flavors of dried tomatoes, caramelized onions, oregano and a bit of aged chèvre. We top it with a homemade caramel that both balances the flavors and gives the tart its glossy appeal… The result is a dish that at its core is very rustic but will certainly please the modern gourmand, balancing savory and sweet in an earthy yet elegant manner. Serve this as a dinner entree with a green salad and you really don’t need much else. 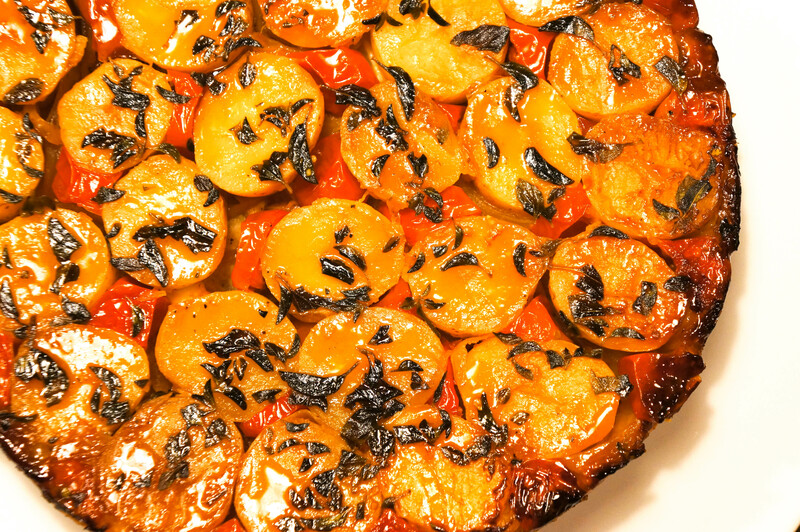 Preheat the oven to 275 degrees F. Halve the tomatoes and place them skin-side down on a baking sheet. Drizzle over some olive oil and sprinkle with salt and pepper. Place in the oven to dry for 45 minutes. Meanwhile, cook the potatoes (whole) in boiling salted water for 25 minutes. Drain and let cool. Trim off a bit of the top and bottom of each potato, then cut into 1-inch-thick discs. Sauté the onions with the oil and some salt for about 10 minutes or until golden brown. Preheat the oven to 400 deg F. Bake the tart for 25 minutes, then reduce the temperature to 350 deg F and continue baking for 15 minutes, or until the pastry is thoroughly cooked. Remove from the oven and let settle for 2 minutes only. Hold an inverted plate firmly on top of the pan and carefully but briskly turn them over together, then lift off the pan. Serve the tart hot or warm. Recipe and inspiration courtesy Yotam Ottolenghi.